Sheep were distributed to farmers. In October 2016 a devastating hurricane tore through Haiti, leaving behind a path of destruction. Hurricane Matthew was a category 4 storm that caused great damage to physical structures. The storm destroyed crops and killed livestock as well as food. Canadian Anglicans responded with almost $90,000 in designated donations to help the country recover. But as with most disasters, the recovery can be long-term as families struggle to rebuild their communities. PWRDF Partner Fondation Nationale Grand’Anse (FNGA) has been working hard to ensure that the families most affected are empowered with the resources to rebuild from the storm. In a project that is continuing through this year, FNGA has targeted the most vulnerable members of the population and has worked to ensure the active participation of women. FNGA identified 208 beneficiaries, 90 of whom are female, who were the most vulnerable following the hurricane. FNGA also looked for people who had farming experience and land to cultivate in order to ensure the work of the project was in line with the ministry of agriculture. The project sought to provide beneficiaries with the ability to generate their own sources of food again through: rehabilitation of livestock, by providing agricultural training and inputs and taking measures to protect farmlands. 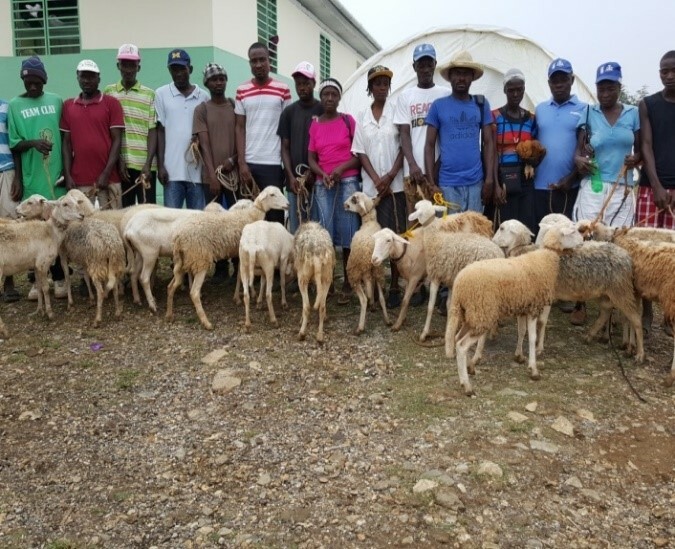 The project bought and distributed 135 sheep to 135 beneficiaries across the region and trained 109 beneficiaries (including 48 women) on sheep farming techniques. This training will help beneficiaries breed livestock and distribute to other members of the community. Many beneficiaries also participated in a cash for work program to ensure the sustainability of the crops. They built 500 metres of stone wall to protect the crops from erosion. Thanks to the work of PWRDF’s generous donors, those in greatest need in Haiti have been able to begin to get their lives back on track.